The lever action forge was intended to "wean" blacksmiths from the bellows. Thus they used a pumping motion rather than a crank. Later blowers all had cranks. The mechanism consists of a segment gear turning a pinion transmitting rotation to a shaft through an over-running clutch. The over-running clutch lets the handle and segment gear move in a cyclic motion while the shaft rotates continuously in one direction. The shaft turns a combination flywheel/pulley from which a 1/4" diameter leather belt transmitted the motion to a pulley on the blower. A few of these type devices were manufactured without the overrunning clutch and used a small crank motion like an old foot treadle sewing machine. 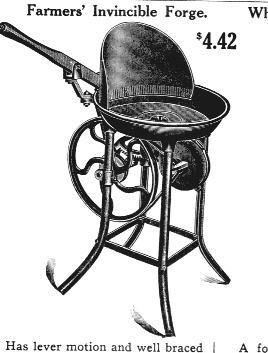 Image, page 82, Reprint of the 1915 Sears, Roebuck and Co., Tools Machinery Blacksmiths' Supplies catalog. Originally reprinted by the Mid-West Tool Collectors Association in 1984 and ABANA in 1985.